Christian J. Lange, Assistant Professor of Architecture is currently co-organizing a symposium entitled 2020: Housing China. The symposium will be held at the Department of Architecture at The University of Hong Kong on May 10&11 2013. China’s urban population will increase in the next twenty years from about 50 % at present to almost 70% by 2030. With an estimated 300 million people moving to the city by 2020, China will change from a rural into an urban society. This transformation will influence the environment and habitation patterns of almost a quarter of the nation’s population. This rapid urbanization will not only have a significant impact on material resources, the society and the environment, it will also initiate the most prominent housing laboratory in human history challenging designers, planners and builders alike. As a socio-political microcosm, Hong Kong has been dealing with the impacts of hyper-dense urban environments since the mid-twentieth century. During the past three decades the city has been also an active player in the development of China’s housing through various public and private initiatives. The essential questions are: What are the models at hand and is Hong Kong the right model for China? What are the alternative options and how can we make a difference through critical review and proposition? 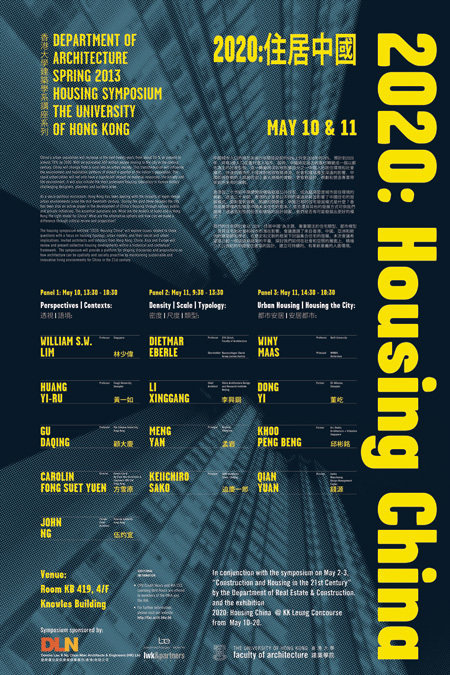 The housing symposium entitled ” 2020: Housing China ” will explore issues related to these questions with a focus on housing typology, urban models, and their social and urban implications. Invited architects and scholars from Hong Kong, China, Asia and Europe will review and present collective housing developments within a historical and contextual framework. The symposium will provide a platform for shaping discourses and propositions on how architecture can be spatially and socially proactive by maintaining sustainable and innovative living environments for China in the 21st century.